I’ve been slowly getting things up and ready to unpack the basement and the more I work around down there, the more I see how to use the space. One of the things I’m excited about is the open space to set up games in. 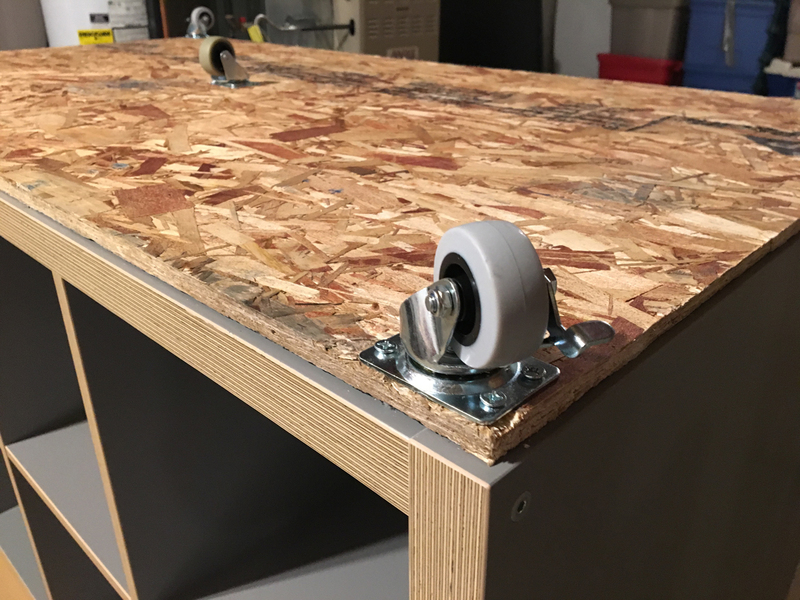 While the basement is unfinished (unlike the last house), I’m starting to like the flat concrete floor as I’m now fascinated with casters and making everything mobile. It started as a way to lift my shelving up off the floor in case of a low flood out but now the potential has opened up other options. 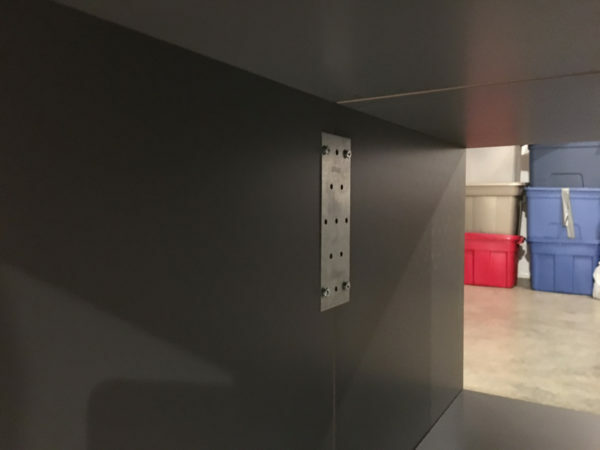 One option is movable storage like the case with these two 4×2 Kallax shelf units from IKEA. 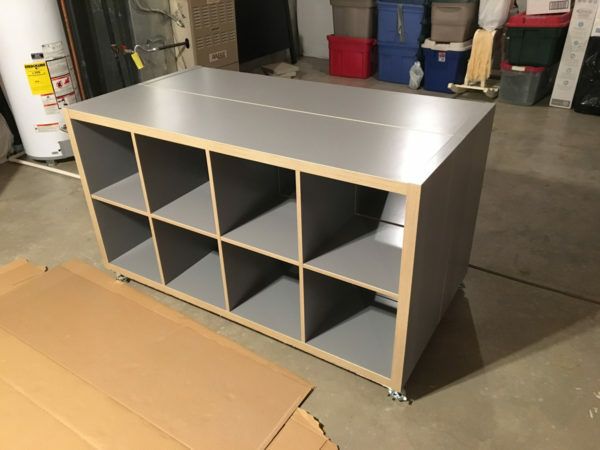 At $65 a piece, they make nice storage pieces and I’ll need it since I lost a lot of built in storage in the new basement. Storage itself, isn’t really much to talk about but I saw this great idea and new I had to try it for my gaming. 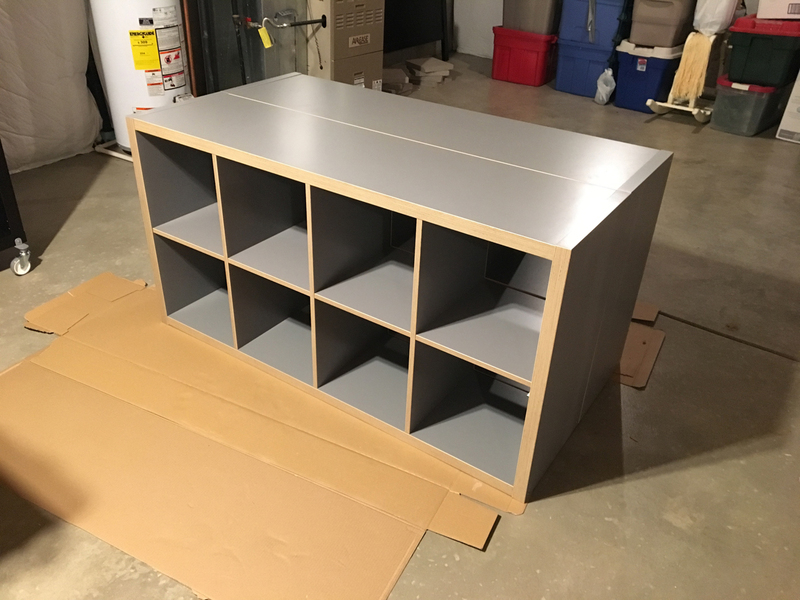 Panyl wasn’t the only one to come up with the idea of joining multiple Kallax units together but their process is quite simple and affordable. I don’t need anything near as large as what they created but this storage will go great with my other shelf units. After assembling the two units, I join them together just as Panyl did with simpson brackets. This flat piece will eventually be the top as a bracket on the bottom will be annoying to move game boxes over. 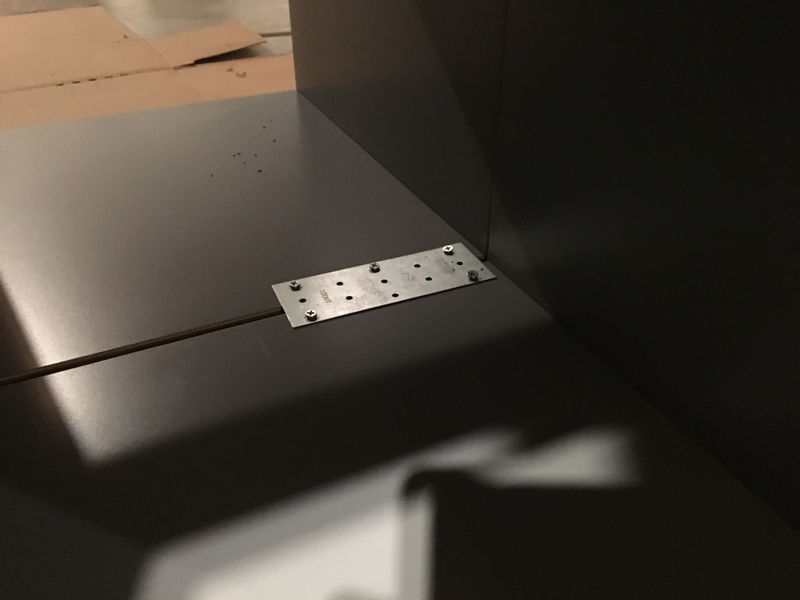 For the “bottom” of the unit, joining the sides will work to keep the boxes from getting damages on the bracket. The bottom is then secured using some scrap 3/4″ OSB. I have six wood screws mounting it on the bottom. The main reason I even wanted to make this unit was because of the casters. Being able to roll this out of the way for storage will really maximize the space down there. After flipping it over, Phase 1 is complete. It rolls easily and is a solid platform for Phase 2. 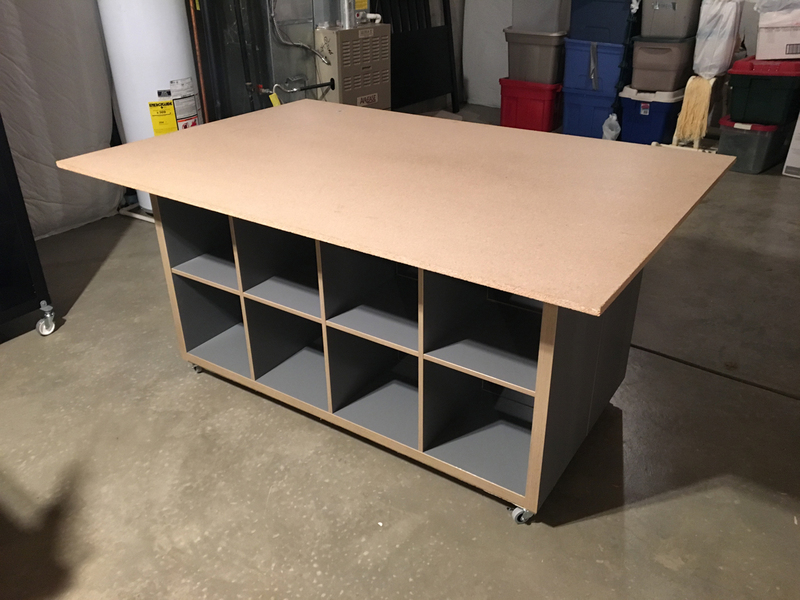 I’m not there yet as this pressboard is just resting on top but making the unit into a full 6′ x 4′ tabletop minis table is the dream and with all the storage underneath, the unit becomes a one-stop shop for all my minis needs. 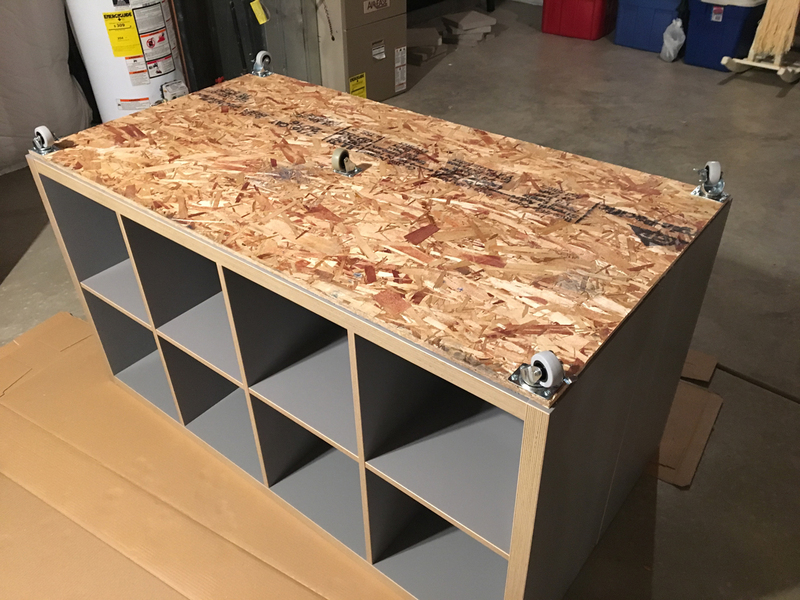 I’ll be mounting the tabletop next and will update again when Phase 2 is complete.